Harlem has a special place in the American imagination when it comes to culture, art and music. But would you also imagine small-batch beer? Well. 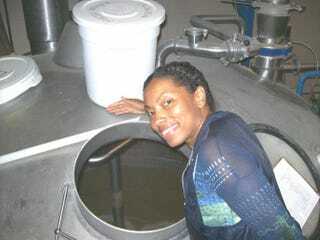 The Harlem Brewing Co. is a 15-year-old microbrewery founded in its namesake New York community. In March the company will be stocking its wares front and center in 39 Wal-Mart stores across the state. “I hope it turns into a Patti-pies situation,” Celeste Beatty, owner of Harlem Brewing, said, laughing, during a phone call with The Root. Beatty got onto Wal-Mart’s radar after an exec saw her on an MSNBC segment with Tamron Hall. She says that people were also calling the retailer and asking for the brand—which currently includes Sugar Hill Golden Ale, Harlem Renaissance Wit and Strawberry Hard Cider—by name. With the Wal-Mart deal, Beatty says she expects sales to increase by as much as 20 percent. Beatty’s yeast-fermented quest began a lifetime ago when she started brewing 5-gallon batches of craft beer around the corner from her Harlem apartment. These days, she is growing her own hops both in her backyard and on a farm in upstate New York. “I’m actually getting pretty deep into it,” she says, noting that after nine years, growing the annuals is like phoning it in. The Shaw University grad grew up in Winston-Salem, N.C., and admits that she used to be a “future farmer of America.” Be that as it may, she never imagined that she would be bringing her agricultural roots to Harlem. But in retrospect, it makes perfect sense. “It was instinctive to go into this whole craft beer culture. It’s so aligned with so many things I love, like cooking and gardening,” explains Beatty, who says on her website that craft beer is like her mother’s amazing homemade soups (almost). The New York Post reports that a Wal-Mart spokesperson said that craft beer is a growing category for the retail behemoth, and it is seeking brewers in the U.S. as part of a $250 billion investment over 10 years, supporting American manufacturing jobs. “They didn’t ask me to lower the price, which was nice,” Beatty says of Wal-Mart. “That was something I was surprised about, because everyone said I would take a hit. I’m selling to them for the same price I do any other retail.” Harlem Brewing Co. six-packs cost between $10 and $12. Beatty says she’s shooting to get floor-display space this year and hopes to move into Wal-Mart stores in other states. Currently, she is on retail shelves in New York, Atlanta, the Carolinas and Detroit. The glass is certainly full for 2016. Beatty will be teaching a “Brew U” class at the City College of New York next semester, “The Art of Brewing From Africa to America,” and she recently put in an offer on a space in West Harlem for a production brewery, which will include a tasting room. For those not in the know, beer is the oldest alcoholic beverage and the most popular drink in the world behind water and coffee. Angela Bronner Helm is a writer, editor and professor of journalism at the City College of New York. Follow her on Twitter.